SHUATS being established under U.P. State Act No. 35 of 2016, as passed by the Uttar Pradesh Legislature is offering 'Theology' as an academic discipline. The Ministry of Human Resource Development of India (Ref: D.O. No. F. 20-71/2005-U-3, December 21, 2005) has clarified that in terms of the provision under article no (1) of the Constitution of India, the University may conduct its courses in 'Theology' in whatever mode it wants to, as it has the right to do so. On the basis of the above mentioned notification, the University Grants Commission, in its letter No. F.6-1 (II)/2006 (CPP-I), dated 15th July 2006 issued clarification that the Ph.D. Degree in Theology awarded by SHUATS, formerly Allahabad Agricultural Institute, Deemed to be University is a specified and valid degree as per section 22 of the UGC Act 1956. The Faculty of Theology had a humble beginning in 2002 in a small class room with seven students. It was in 2003 when the foundation of Gospel and Plough School of Theology was laid with ground breaking ceremony but was consolidated in 2008. Now it has grown to be a full Faculty. The special strength lies in Faculty of Theology along with Faculties of Agriculture, Engineering and Technology, Science, Management, Humanities and Social Sciences, Health Science. A student in Theology learns not in isolation of walls of a seminary but in the context of an environment of five other faculties with twelve thousand students in the campus. 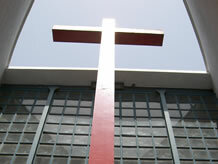 "Equipping and producing servant leaders who know God’s word, engage in God’s world and discern God’s will for His entire ‘oikoumene’ following the legacy of the Founder"
The CBCS provides choice for students to select from the prescribed courses (core, elective or minor or soft skill courses). The choice based credit system provides a ‘cafeteria’ type approach in which the students can take courses of their choice, learn at their own pace, undergo additional courses and acquire more than the required credits, and adopt an Interdisciplinary approach.The Post-graduate degree program is combination of Lecture-Tutorial-Seminar-Research that includes completion of a dissertation of 15-20,000 words on an approve subject in the branch of specialization. The student has option to choose elective course offered by other Faculties of the University. The Doctoral candidates are required to undertake 30 Credits course work, Comprehensive Examination and write a PhDThesis of 45 Credits.